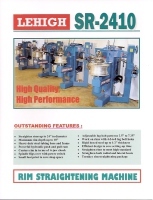 Why Lehigh SR-2410 Rim Straightening Machine? Lehigh SR-2410 rim straightening has been proven to be the very best wheel straightening machine from its design, its reliability, its durability, and its efficiency, and its performance. The installation of one rim on this machine is a matter of one minute. And the rim will be secured at the lug hole positions via radial clamp. 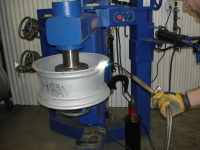 When a rim is installed on SR-2410 wheel straightening machine, it is automatically centered with the spindle bearing. That gives measurable accuracy, for which most other machines do NOT have. Each rim can be set up its working position for facing up, or facing down, or facing on sideway just like the position on the tire change machine so that the operator can easily work on all kind of bents without taking the rim off the machine until they are all fixed. This is very important for production shops so that they can use one SR-2410 alloy wheel rim straightening machine to fix up to 60 to 80 rims a day. 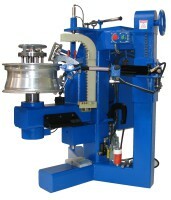 The hydraulic system on SR-2410 alloy wheel straightening machine is specially designed so that it is more powerful than other kind of alloy wheel straightening equipment, but yet, it moves in a controllable manner so that the rim to be repaired is unlikely cracked during the repair process, which happens every day on many other low cost wheel straightening machines. "Can't beleive its almost 7 years since purchasing both Lehigh rim repair CNC machine and wheel straightener. It was definitely the smartest thing I did to grow my business to where it is today. Both machines have been fantastic and could not live without them. They are running all day everyday and never miss a beat. It is hard to find machines that are built of this quality in today's market and it's a credit to all team at Lehigh." ​​How many bent rims are out there? Why damaged wheels must be fixed? What is the standard to fix the bent rims? What takes to build a great rim straightener? 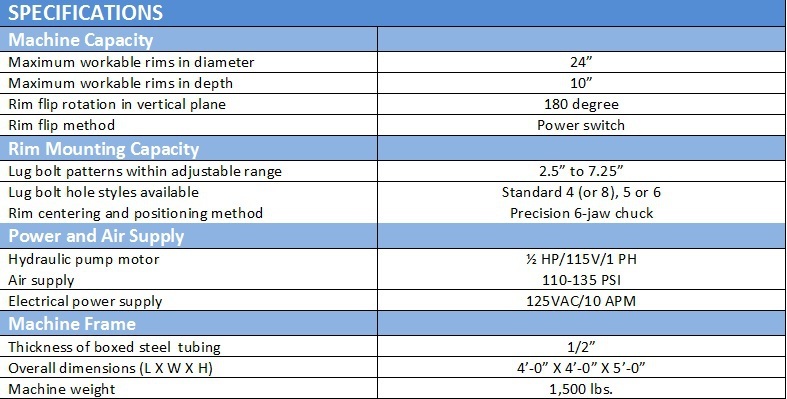 Why to use Lehigh SR-2410 Rim Straightening Machine? 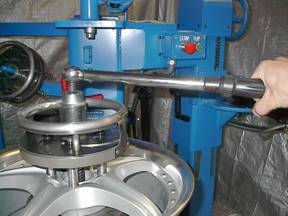 There are two hydraulic cylinders on Lehigh SR-2410 alloy wheel straightening machine. One is designed for radial direction bent (or radial runout) and the other one is designed for lateral bent (or lateral runout). Maximum workable rim depth up to 10"
Adjustable lug bolt patterns within 2.5" to 7.25"
Step 1. Inspect the rim carefully for possible cracks and serious damages. Step 2. If the rim is deemed to be reparable, mount the rim on SR-2410 bender. Step 3. Positively LOCK the rim with torque wrench before apply any force. Step 4. Heat the aluminum rim before attempting to straighten it. Step 5. Locate the dent area and bend spots on the rim. Step 6. Select the desired Pull Hook. Step 7. Adjust vertical ram position to the depth of the bending. Step 8. 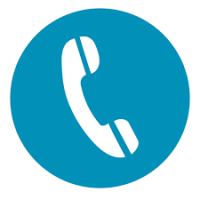 Use dial indicator to check the roundness before any attempt to push or pull. Step 9. Push the Ram Control Switch to pull / or push on the rim. Step 10. Repeat the pull / or push on the rim to reach the required tolerance. ​Step 11. Rotate the rim and work on the other side of the rim. Step 12. Remove the rim from the bender and inspect the rim again fully.